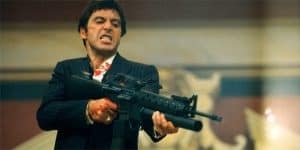 Scarface Remake Casts Diego Luna in Lead Role | Nerd Much? The Scarface remake has found its lead. While we are still ways away, it’s almost time to say hello to my little friend. Now to find a director. According to Variety, Diego Luna will be starring in Universal’s upcoming Scarface remake. We have to admit, Luna does have a surprisingly similar appearance. Star Wars fans should recognize Luna from his role as Cassian Andor in the recent Rogue One: A Star Wars Story. While we finally have our titular character, the movie is now without a director. Antoine Fuqua has supposedly left the reboot to work on a sequel to The Equalizer for Sony and Denzel Washington. The director was very interested in helming the Scarface remake, but there was no way to fit in his schedule. Luckily, this departure shouldn’t affect the film’s production. Universal is already searching for a replacement director so they can begin production this spring. The script has been revised a few times. Penning the latest draft is Terence Winter from Boardwalk Empire. Previous iterations included Jonathan Herman from Straight Outta Compton. What do you think of rebooting Scarface? Is this a beloved character that should be left alone or are you interested in a new interpretation? Sound off in the comments below.